Ten minutes before the train stopped, I started to wonder if I’d made a huge mistake. “11º” read the display on the train screen, flashing across in red letters. Heavy rain pounded the window, leaving long streaks of water that blurred the window. I zipped my thin jacket all the way up, shrugging my neck in hopes of covering more of it up. Maybe I should have stayed in my cozy bed instead. But…I decided as I was already there, I was going to make the most of it. And I was pleasantly surprised to find that the festival was just as pretty as I’d been hoping. Girona is one of the prettiest cities I’ve visited in Spain, but for one week in May it becomes even more beautiful. 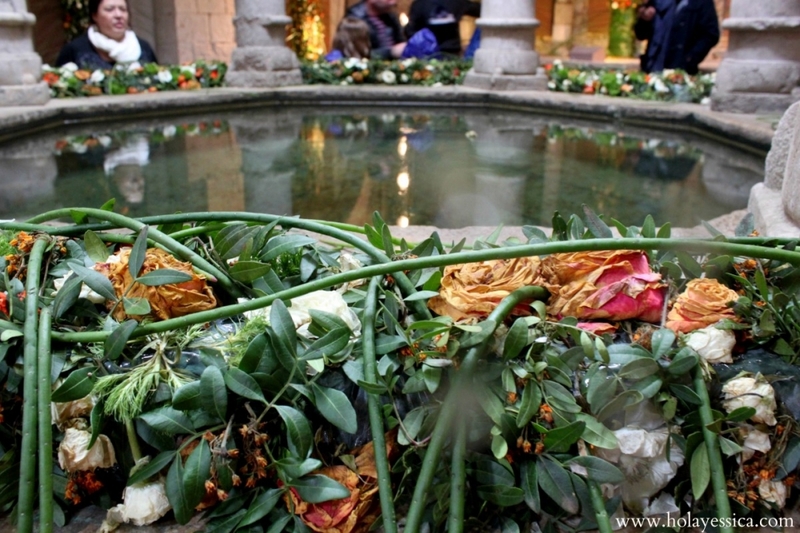 During the Temps de Flors, the medieval city center gets cloaked in fresh flowers to celebrate the arrival of spring. I walked away from the train station towards the river lined with colorful houses and crossed by elegant old bridges. All the restaurants had their terraces set up with flowers on the tables, even though they were empty. Not even their promised offers of a plate of free freshly-picked olives with a glass of wine could convince people to sit outside in the rain. I picked a small, intriguing street with an entrance covered in hundreds of meters of white gauzy material dotted with flowers, and within a minute was in front of a towering church that had been hidden from the main street. This wasn’t a normal church any more though; the long stained glass windows had streams of vivid red branches tumbling out of them. The stairs up to the old wooden doors had a covering of green grass and big red flower displays. The flowers looked like letters, but I couldn’t tell what they were supposed to be spelling out. I moved on. 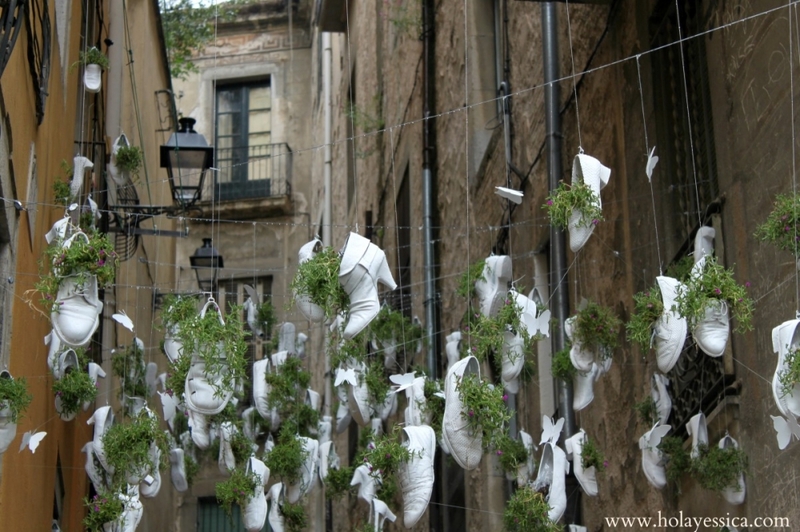 The Temps de Flors festival is a new one, at least by Spanish standards (it started in 1955). The first year it just had an exposition of flowers at a church, but now the whole city is decorated with bright carpets of flowers, special floral sculptures, and art. A lot of museums and important buildings open up specially to show off their pretty displays, along with private patios and gardens that you wouldn’t otherwise get to see as a visitor. The best and biggest displays are centered around the cathedral and Arab baths. The steps to the cathedral are probably the biggest single bunch of flowers and greenery that I saw; it covered the whole enormous flight of stairs, all the way up to the white façade of the building. 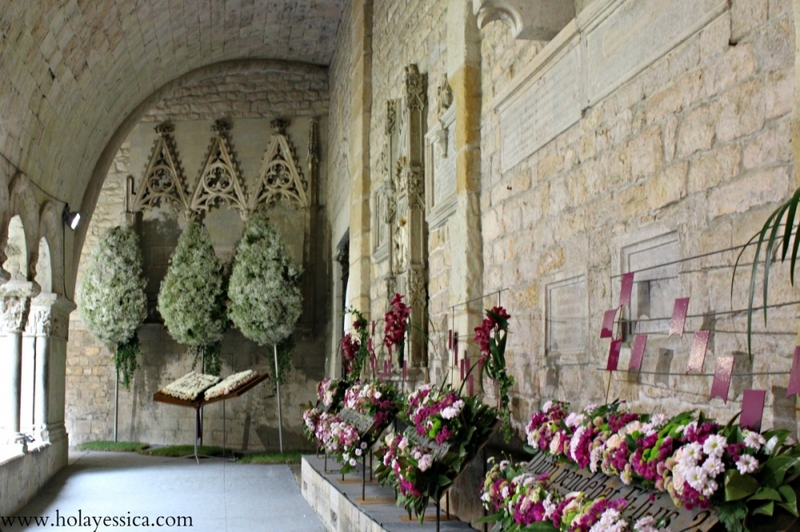 But the prettiest part of the cathedral is the cloister, whose arched hallways were decorated with large leafy books with pages made out of pink and purple flowers and oversized vases overflowing with masses of tiny white flowers. Just around the corner from the cathedral are the “Arab” baths (they aren’t really Arabic at all; they’re romanesque). The relaxing pools of water normally reflect the star-shaped window details in the ceiling, but for the flower festival you can also see the misty reflections of orange lilies in the still water. In the dark, enclosed baths, a sweet smell rose up from the flowers, followed by a very faint rotting smell. Having been up for a week, these flowers looked beautiful, but they weren’t going to last much longer. The foot traffic pushed away from the baths, and out onto the upstairs viewing patio. Everyone else seemed to have an umbrella or rain jacket, so they were happy to stand outside and take in the views of the hilly countryside and old medieval buildings. I took quick one look, then sprinted back inside and out of the chilly rain. This isn’t exactly a secret festival as I’d promised in the title. It’s definitely well-known around Catalunya, and the streets were packed with local families and small groups out for the day. But I didn’t notice very many foreigners, which seemed unusual for a large festival so close to Barcelona. Most of the crowd’s excited chattering was in Catalan; a big change from Girona’s neighbor city Barcelona, where it can be tough to find people to practice Catalan with. In Girona, it was hard not to. When I talked to people, they chattered back in Catalan. I wondered if I should have spoken in Catalan at the train station as I walked through the old Jewish quarter, stopping every few minutes to look at the decorated patios. At this point in the late afternoon, I was absolutely soaked. My hair looked like I’d just gotten out of the shower, and I was cold, hungry, and on the verge of becoming pretty grumpy. All during lunch, I debated whether to stay or leave the festival. On the one hand, there were a few streets I hadn’t seen yet. On the other hand…it was only few, and I was really cold. As I walked back towards the river, the wind picked up again and it was absolutely pouring with rain. That was it; my tolerance for the cold was up. Luckily, the train station was close by and I managed to jump on a train literally seconds before the doors closed and we were whisked back to Barcelona. The train ride was a pretty trip through the green Catalonian countryside north of Barcelona, with occasional glimpses of tall churches, stone farmhouses, and crumbling old cottages and factories. Inside away from the rain, I pressed my face almost right up to the window and started enjoying my mini-trip again. I was shivering and coughing, but happy to have seen another one of Spain’s fabulous festivals. When: The second or third week of May (check the official site for specific dates). How to get there: Trains and buses go from Barcelona city center regularly; check the Renfe and Estació Nord websites for details. Paying for the second-cheapest train (an extra €3) will get you a much more comfortable seat and slightly quicker ride. Also, P.S. – who’s going to be watching the new season of Arrested Development today? If you find a way to get it to work in Spain, let me know so I can get my fix! Beautiful! Sounds like an amazing festival, I love the white shoes, awesome shot. The most inexpensive European vacation I ever took. Looks lovely. 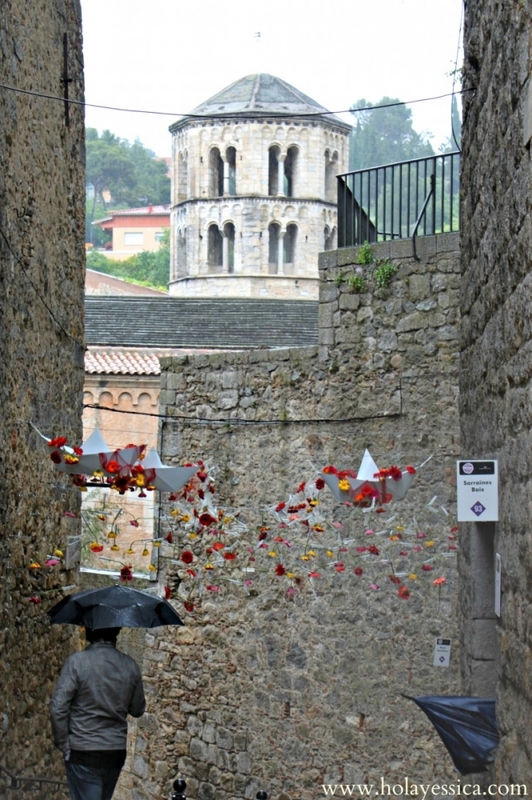 I am going to Girona in July – a shame the flowers will be gone! Even without the flowers, it’s a stunning city. I hope you enjoy it! I knowww, I just want to go to the beach already! Is it cold by you as well? 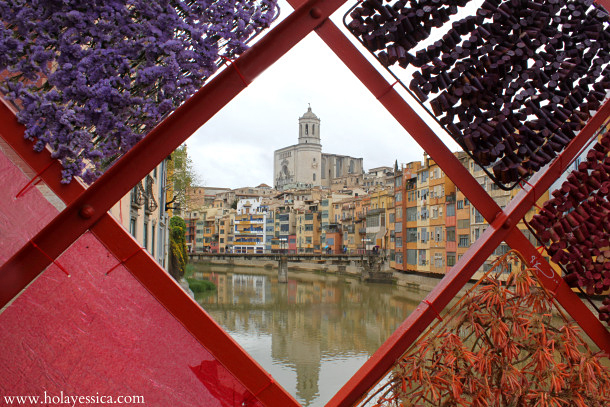 I love reading about my beloved city, Girona, and Temps de Flors on your blog. It’s one of my fav times of the year!!! All the city is even prettier, if that’s possible 😉 , with all the flower exhibits! 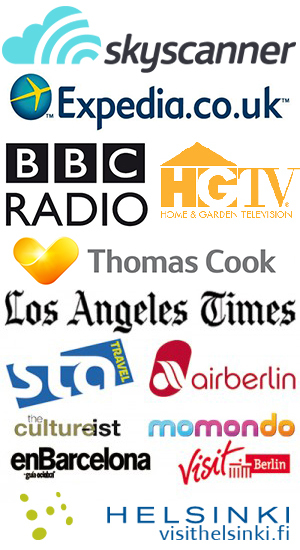 You can watch the shows online or download them. It was so beautiful! You’re lucky to be from such a pretty place. 🙂 I was there the last Sunday, but I wish I’d gone earlier because it rained so much. Thanks for the Series Yonkis site, I like that one! If you like flowers, you’d love going to this festival! And of course, you will find me a job there. Such a pretty time to visit! I’m dying to get to Girona! You should go! 🙂 It’s really pretty all year round. The flowers just make it prettier. It is! It’s a really cute little city with tons of cool historical stuff to see. I love that first photo – what a great shot! Girona looks lovely. Thank you! Girona is really, really pretty. Love those shoe flower pots! Me too! I thought they were so much fun. It looks beautiful despite the rainy weather! And I agree about the shot with the shoes, how creative! Yep, even though I hate the rain with (almost) a passion, it was gorgeous! I am drooling over these photos. I LOVE flower festivals, I almost passed out from excitement at the patios in Cordoba, so this will be another one I will have to visit! Ooh if you like flower festivals, you’d love this! I’m dying to go to the Cordoba festival, I still haven’t made it down there for it yet. Girona was a very pleasant surprise. Very old historic center. If you go, get ready to walk a lot of hills and stairs. It takes lots of flowers to cover those stairs leading to the Cathedral. Try Casa Marieta for a good meal – they are in Plaza Independencia. Walking those medieval streets at night transports you to a different era. You’re right, there are lots of hills and stairs in Girona. I wish I’d read your restaurant suggestion before I went! I have got to get to Spain…these pictures are a dream! Thank you very much! It really was such a lovely festival. Fabulous! 🙂 Andrew Petcher sent me here as I’m hoping to be in Barcelona in early November and would love to fit a day in Girona into my trip. I have no hope of seeing this festival ever, as we have a place in the Algarve and ventures outside of there are few these days. I’ve been to some amazing flower fests elsewhere though. Tomar’s Festa dos Tabuleiros was pretty special. Ooh thanks to Andrew! 🙂 Girona is beautiful, flowers or no flowers. It’s a really easy train ride from Barcelona. The AVE trains go in under 40 minutes and are usually only a couple euros more expensive than the regular ones. 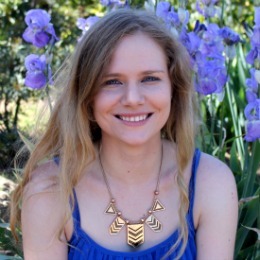 I was new to blogging last year and I guess I have explored hundreds of different blogs over the year – people who live in Spain, writers, photographers, foodies, book reviewers and some I struggle to define! That’s a lot of reading. And you too have read my blog, in its first year, when I was finding my way. So as a big THANK YOU for your support, I’d like to nominate you for the Dragon’s Loyalty Award.